You know what’s stressful? Planning to pump breastmilk at work while your baby is in the care of someone else. It’s stressful to think about how you’re going to juggle work and milk-making, and it’s stressful to worry that your baby will have enough to eat. But if you chip away at this big, scary change one piece at a time, you can make it manageable. That manageability starts with building up a little stash of milk in your freezer so you can go back to work confident that your baby will have milk while you’re gone. Most insurance plans are required to cover a breast pump. Flip over your insurance card and call to find out what your options are. Unfortunately, there is no requirement that it be a double-electric, which you’re going to want if you’re going back to work. So make sure you ask for details about what kind of pump you can have, and how to get it. Ideally, you’d get it before you give birth, so you have it at home right away. If your insurance company doesn’t allow this, task your partner or a friend with getting it for you immediately after the birth. Call a friend who’s been there – or a lactation consultant – and have them walk you through it within a couple of weeks of giving birth. It’s going to be weird and awkward the first time, so a friendly face will help a lot. 3. Start pumping breastmilk once a day. 4. Figure out how much breastmilk you’ll need. The obvious answer to “how big should my freezer stash be?” is, at minimum, a single workday’s worth of breastmilk. This assumes that you’ll pump enough on your first day back to replace that milk for Day Two. But the first day is hard, and the stress of it might mean you produce less milk than you’re hoping for. Shoot for about three work days as your freezer stash goal, which will give you a little buffer. (If you can do more than this, great, but remember to get in your rest and bonding time with your baby, too!) Pediatricians estimate that newborns consume 26 ounces of breastmilk, on average, per day. Let’s say you have to go back to work at three months postpartum, and your three-month-old baby is eating about six times per day (your baby could be eating more frequently – you can always change the math!). 26 divided by 6 is a little more than 4 ounces per feeding. If you’ll miss three feedings while you’re at work, you need 4+ ounces times 3 = say, 13 ounces of breastmilk for a single workday. So three workdays is about 40 ounces. That may seem like a lot of milk, but imagine this: if you can start to bank just one ounce per day, you can make that stash in just over a month. And some women produce more than an extra ounce per day. 5. Store any breastmilk you make. You might be tempted to use this extra milk as a late-night bottle while you sleep. That’s totally your call – but if you want to exclusively breastfeed, think twice about sleeping through feedings so early on in your baby’s life. It’s exhausting, but sticking with round-the-clock nursing while your baby is very young will set up your milk supply for later on. So store that pumped milk for its back-to-work purpose. You can freeze very small amounts in individual plastic breastmilk storage bags, or refrigerate what you pump and combine it every few days, and then freeze. 6. Teach caregivers about appropriate feeding. Caregiver overfeeding can really cut into your breastmilk stash. Teach all caregivers about proper handling of milk, including milk storage guidelines, whether you’re comfortable with them reusing milk in a bottle that the baby didn’t quite finish, and paced feeding, a technique that can reduce overfeeding. So get in there, mama, and make your little milk stash. You’ll breathe easier because of it, and head back to work as a pumping pro. And remember: your worth as a mother is not measured in ounces. Working and mothering and breastfeeding is a really difficult triple job. If your job doesn’t allow for exclusive breastfeeding, that’s not on you – the system is not set up to help you succeed. Many working mothers make combination feeding work, and some eventually move to formula. You are a great mom, doing a great job – don’t let anyone tell you differently. 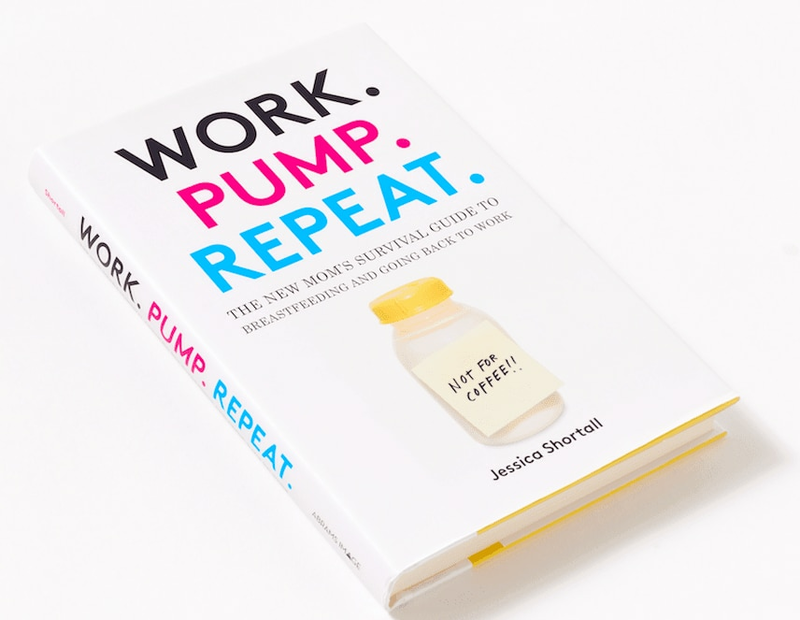 Jessica Shortall is the author of Work. Pump. Repeat: The New Mom’s Guide to Breastfeeding and Going Back to Work (Abrams, 2015), which is available everywhere you can buy books. She is also a vocal advocate for paid parental leave. You can find her on facebook, twitter, and Instagram.